The first part of this interview, where Jed talks about his formation as a coach, can be read here whilst the second part of the interview, where he talks about how to establish a style of play, can be found here. If you enjoy interviews like this one, then you should check out Blueprint According To...Volume 1. When the World Cup comes over next June, you can rest assured that one of the most commonly used phrases whenever Spain are playing will be tiki-taka. It is somewhat inevitable, given that they’ve come to dominate world football with that style of play. The overuse of this phrase, however, doesn’t guarantee that what this style really encapsulates is widely understood. 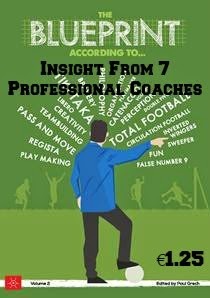 Trying to explain in detail how this system has evolved, and how it is played, is what Jed Davies has done in his book “Coaching the Tiki Taka style of Play” and what he talks about in the final part of his interview with Blueprint for Football. People see tiki-taka as the Spanish term for a passing game. But it isn't only that, is it? Just like Rinus Michels not liking the term Total Football (he preferred the term pressing football), I actually don’t particularly like the term ‘tiki-taka’ to describe the pressing-possession philosophy. Strictly speaking, the term ‘tiki-taka’ was a reference made to the quick one touch passing in a game of football that we commonly see in the Rondo exercises. However, it’s since been popularised as the overall philosophy term by the media and I think most in the media look past the other components that make up the philosophy. The philosophy has so many details within it: aggressive pressing, possession, a strict and disciplined fluid positional system that supports it’s own playing principles and of course, the way it treats each of it’s transitional moments. You really cannot isolate any one of those aspects of the game and reproduce the same style of play that Barcelona and Spain use. What attracted your attention to this system of play? And how did you decide to write a book about it? Barcelona and Spain have achieved everything over this last decade and that isn’t a result of a God passing down talent to those players involved. It was that thought that left me wanting to not only analyse their tactical models but dig a lot deeper and find out everything about the philosophy known as ‘tiki-taka’. I’ve always been fascinated with how you can take an idea and translate that through to players or a single player onto a football field as I mentioned in question one, but what Barcelona and Spain were doing was something far greater than that. The more I dug into what this philosophy might encompass, the more I realised I didn’t know! I wasn’t making notes and speaking to coaches involved in the professional game with the direct intention of writing a book from the very beginnings, it was more a two year long self-directed research project that involved various club visits and interviews. However, the larger my collection of notepads became the more I felt that these were studies worth sharing. 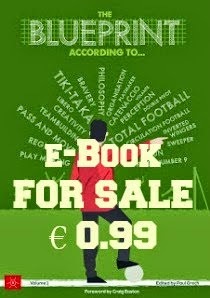 After recommendations from friends I got in touch with a few publishers and fortunately SoccerTutor.com Ltd and two others got back to me offering different deals as it were. It wasn’t a question of who could offer me the most money, it was a question of how I could get this out to the most people possible and SoccerTutor offered me the opportunity to get my book out there on a global scale and thankfully no promises have been broken, they’ve been true to their word and helped me achieve that. What have you tried to achieve with the book? What do you hope those who read it get from it? So for me it was always about finding a way of sharing the research I had done with as many like minded people as possible but also to find a way to connect with these people who were on the same journey through rediscovering football as it were. I’m glad I went ahead and through all the troubles involved with getting a book published as it has allowed me to get in touch with the people I speak to on a regular basis and in turn, helped me grow as a young coach. I’m hoping that those that read the book will read something in there that sends them off onto a completely different approach to how they view football or an aspect of it at least. I’ve had some fantastic responses from the book - people who work for the national U21 side in Wales, England Women’s manager (Mark Sampson) and guys like Louis Lancaster reading it - that for me is everything I could have wanted and more. The book wasn’t ever meant to be my opinion about ‘x or y’, but a collection of opinion’s from those who have a substantial experience in the area of football I was looking into and could offer a breadth of knowledge on different areas within that.